The summertime Kellogg’s Rice Krispies Treat Challenge is upon us. After much krispielicious experimentation, Team Asheville is ready to share our entry. 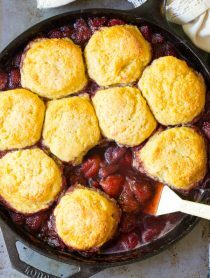 When TheMotherhood.com announced the theme of this season’s challenge “favorite summer pastimes”, we knew COOKOUTS were at the top of our list. Summertime cookouts are something children and adults alike look forward to. Whether at the lake, in the neighborhood park, or in your own backyard, cookouts can be enjoyed by all. Family cookouts bring loved-ones together to appreciate a good meal, warm sunny weather, and most importantly, each other. 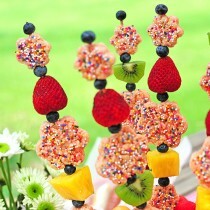 At our cookout, we served these sensational Fruity Rice Krispies Kebabs! Fresh fruit flavors make original Rice Kripies Treats really snap, crackle, POP. 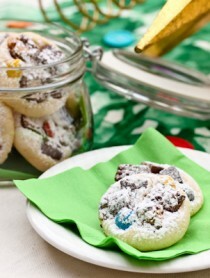 We used powdered drink mix to impart the essence of strawberries and kiwi into the treats. 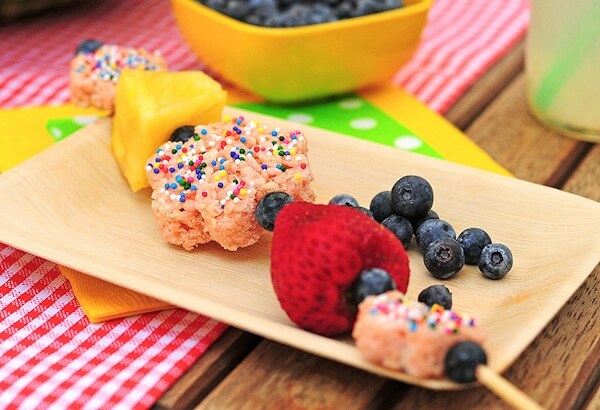 Then we threaded fruity Rice Krispies Treat cutouts and fresh fruit, onto wooden skewers, for a fun and HEALTHY snack or dessert. These kebabs are a wonderful addition to any cookout; no cutlery required! Fruity Rice Krispies Kebabs are a fantastic family-cooking project. Children of all ages will enjoy cutting out the Rice Krispies Treat shapes, pressing them into sprinkles, and lacing them into patterns on skewers. At this family cookout, we served the fruity kebabs in a fresh halved watermelon to display the troop’s handiwork. The watermelon made an easy and festive summertime centerpiece that took just minutes to prepare. In a saucepan, melt the butter and marshmallows over medium heat. Once melted add the drink powder and stir until dissolved. Once cooled, use small cookie cutters to cut the Rice Krispies Treats into fun shapes. Pour the sprinkles on a small plate and press the top of each cutout into the sprinkles. 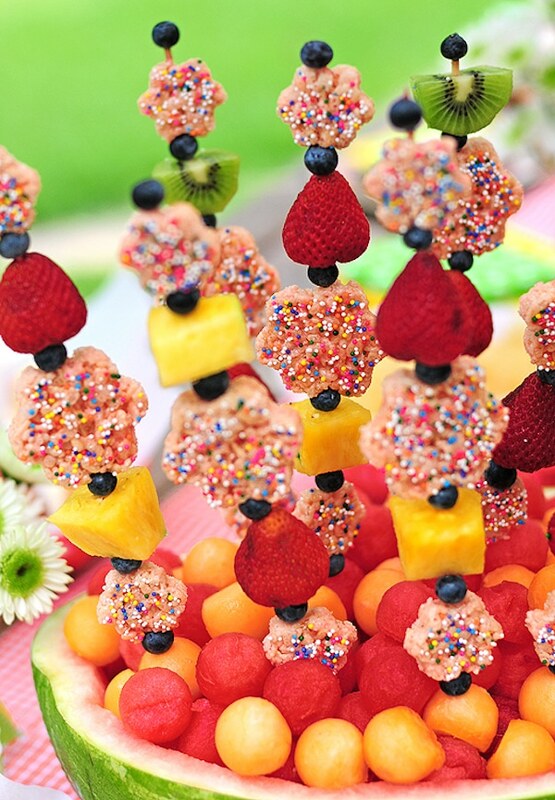 Slide the treats onto skewers with fresh cut fruit and berries. Pingback: Escuela Infantil GRANVIA Vistahermosa » Archivo del weblog » 6 recetas fáciles para niños: ¡brochetas! That’s soo colorful, it’s really pretty! That is such a creative idea, I really love what you did with this. 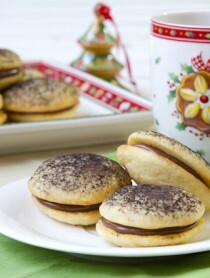 Wonderful light dessert for the summer! Oh wow, so creative and oh soooo cute! Such a creative entry…I love it! Sommer, these are so creative & FUN!!! VOTE! I vote for these! Vote, vote, vote! These are so cute, love them! These are so unique and look absolutely delicious! I voted on all 4 pictures, good luck to you! How colorful and cute these kebabs look. Always ready to support you, Sommer! i love the bright colors! The whole arrangement says “summer”. Your Kababs are beautiful and I love the healthy fruit with it. Are there not suppose to be four photos on the Rice Krispies Facebook page for us to vote on? you keep raising the bar!! Great presentation! Very fun and festive. These are adorable! Good luck! These are so gorgeous and I love thew health benefits of the fruit. Excellent job! Hi Dear, This kababs are looking gorgeous and am sure they are simply out of this world. I simply fell in love with these at first sight and really wished to swipe few off ur screen. My best wishes to you on this challenge and am sure you wud be the winner. With best wishes, Sonia ! These are darling! My daughter would go crazy for these! While I love the nostalgia that a rice krispie square ignites, I don’t like the “stuff” they are made of anymore. This is the healthiest option you could have chosen. Bravo to you! We really need to get our kids off the sweet treats from my era – and yours. In my era, the manufactured, processed, purchased foods and treats were “the best”! Thankfully, the times are changing back to homemade, delicious and nutritious. And, darn the attraction of institutions like Kraft and their money and prizes. I have missed visiting you. My daughter got married last Saturday, and I have been neck deep in celebrations! Skewers of colorful fun!! Love that you used the watemelon with the “balls” of fruit! You will have my vote for sure!! Oh my god! I have never seen kebabs that make me feel so happy before! I love the colors and the design of the rice krispies. You did such a great job!! How cute are these! Perfect for a summer time picnic :) Love em! These are just so cute, sommer! love this, very adorable! Wishing you the best and we’ll help you get those votes! I think these are BRILLIANT! You have a winner! These are so beautiful! I will vote tomorrow and hope you all win. The colors are wonderful! Great job.